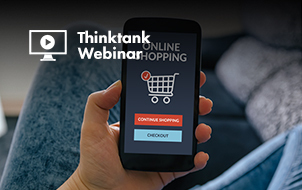 The time of the website as the primary location for online conversions is coming to an end. Google is working hard to become your personal assistant. Chat apps, such as WhatsApp or Messenger along with the rise of chatbots that will offer more personalized conversion funnels and assist with voice activated devices such as Amazon Echo and Google Home. 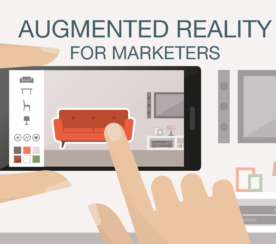 But one of the biggest factors is the rise of VR (virtual reality) and emergence of usable AR (augmented reality), which will see consumers move to other mediums. With big-hitting names including Facebook with the Oculus Rift, HTC with the Vive, and Google with Cardboard, there’s no doubt that virtual reality will join the mainstream marketing mix over the next years. But what does this mean for marketers? 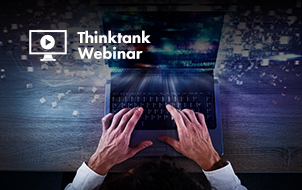 How can you leverage this new technology to connect with your customers? A Goldman Sachs Research report agreed, noting that there are qualities in VR “that can take this from niche use case to a device as ubiquitous as the smartphone”. This is thanks to the captivating power of immersion. The upcoming buzzword for marketers is immersion — a strong feeling of being physically present in a virtual world. If you haven’t yet experienced it yourself, you can watch the powerful impact of this feeling below. Immersion allows an emotional intensity in VR far greater than traditional media. For the first time since TV, we’re adding a new layer of experience to marketing — a technical infrastructure which allows us to be in another place, not see it from the outside. Reading text: You must imagine the scene for yourself. Seeing images: You can view the scene but you are separate. Watching videos: You can see and hear but you are separate. Immersion in virtual realities: You feel part of the world. 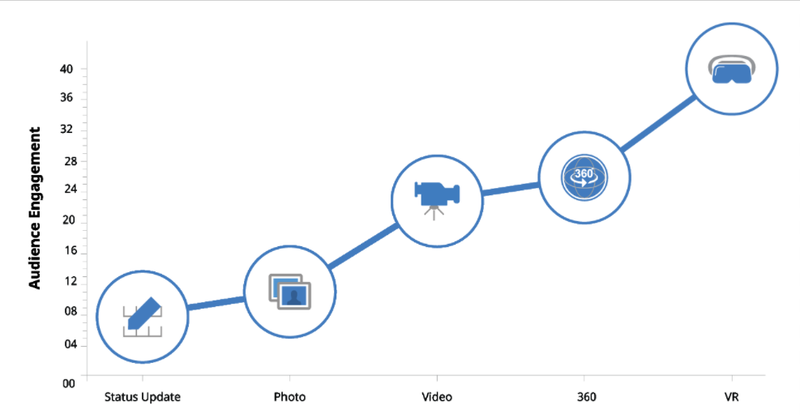 As content becomes more tangible, engagement increases. Immersion, and the strong emotions it triggers, has the power to bring about real behavioral change. And innovative brands are already leveraging this technology. War has driven 30 million people from their homes. How do you get people to care? By bringing them into the lives of those displaced with an immersive documentary. Readers didn’t watch these stories. They experienced the stories for themselves. The result: Over 1.5 million content views and 50,000 downloads of the NYT VR app, making it their most quickly adopted app ever launched. 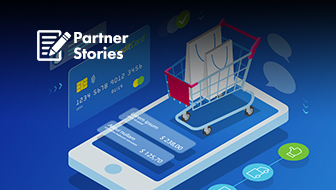 But most importantly, the emotional stories connected with readers and created brand affinity, establishing the New York Times with their next generation of readers as a brand to engage with. As marketers, it’s our job to tell people why they want our product or service and generate the desire to purchase. Merrel achieved this by allowing potential customers to go on a virtual hike and experience the thrill and awe for themselves. The result: 5 minutes dwell time at their booth, with a line to try the experience out the door and around the corner! The campaign reached well beyond the one location’s 750 virtual hikers to a total reach of 500,000 worldwide due to word of mouth and social sharing. But neither of these was the biggest win for the brand. The campaign’s real success was inspiring people to go hiking with Merrel shoes — a testament to virtual reality marketing’s power to influence consumer behavior. 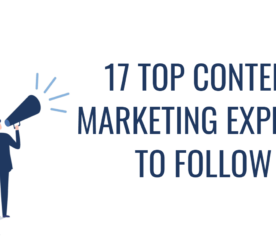 Following these innovative brands, others have embraced VR marketing, including Marriott, BBC, IKEA, McDonald’s, Budweiser, Coca-Cola, TopShop, The North Face, and many more. It doesn’t need to be a big, complicated campaign. Restaurants can bring customers into their kitchens to show how their signature dish is made. Recruiters can immerse candidates in the work environment to see how they behave with challenges. You could meet speakers in a virtual world before signing up to a conference. 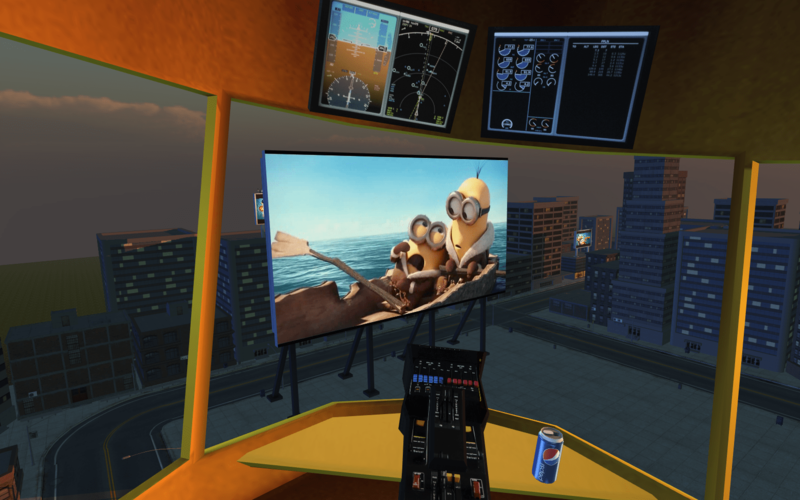 Virtual reality marketing can be leveraged by businesses of all sizes across any industry. Similar to social media, if you don’t live the channel, you’re bound to fail. So spend some time in VR. Ride a virtual roller coaster. Play “Insidious” (only if you enjoy horror movies). Immerse yourself in news. Experiencing the potential of virtual reality will allow you to create better content. Understand that there are different levels of VR. If you want a fully immersive game or a complex, interactive application, you will likely need to work with a VR studio to create the experience. But virtual reality marketing doesn’t need to be so grandiose. You can start small. Spend around $250 on a Gear 360 Camera and make your own videos. In-house creation allows the production more content and, more importantly, the ability to iterate on that content, improving video based on audience reactions. Virtual reality marketing is new, and as such will naturally attract user interest more than traditional channels. However, VR is the platform, not the message — don’t fall into the trap of treating it as the idea. Impactful VR marketing provides meaningful branded experiences where the virtual reality component has an authentic role. You need to know what you want your audience to think, feel, or do and design an immersive aspect to achieve this. 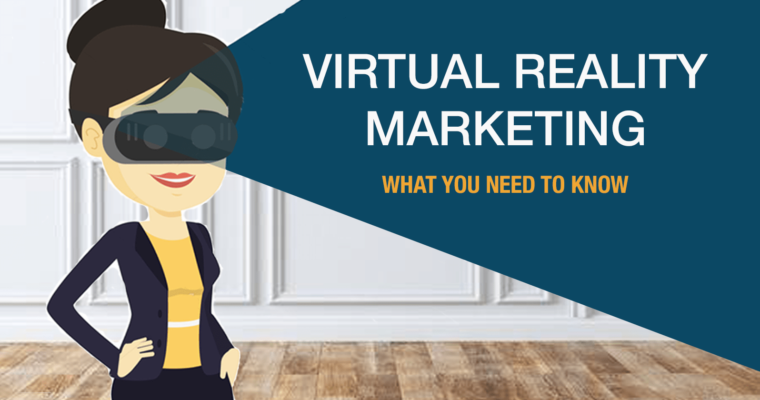 Miss out on the benefits of well-executed virtual reality marketing. Don’t offer meaningful brand interaction. Can’t encourage behavioral change or leave a lasting brand experience. As in the real world, they are at best a distraction, at worst an annoyance. 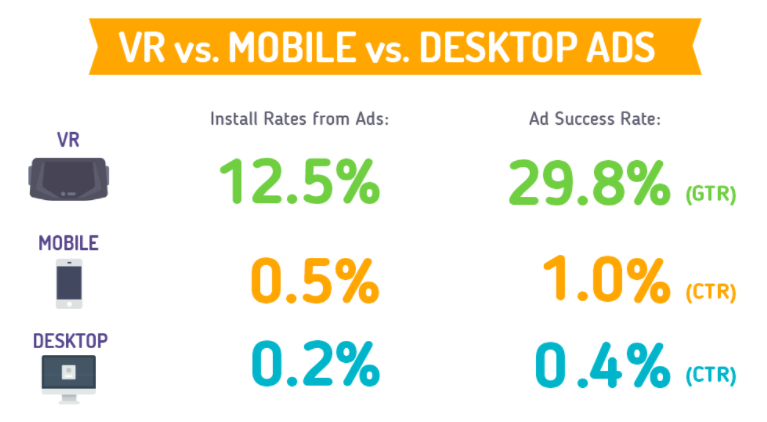 Despite this, there is data to support that such ads can be more impactful than their counterparts on desktop or mobile devices, most likely due to their novelty. McDonald’s with Happy Meal VR headsets to play a skiing game. For many marketers, getting buy-in for such a campaign will be difficult. But more importantly, campaigns end. Virtual reality is a channel where customers will be engaging on a daily basis so you need to have a long-term presence and continually create new content. Live event coverage for publishers. Showing the latest outfits in full 360 glory for fashion retailers. Travel destination snapshots for a hotel chain. 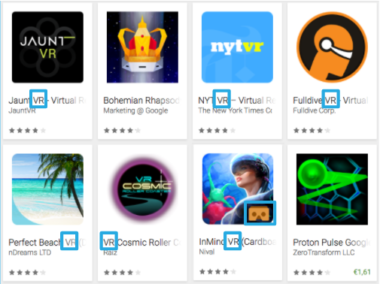 List your VR app in the relevant app stores. Capitalize on app store optimization by adding “VR” in the app title and “Virtual reality” in the app description, and use visual iconography of a Cardboard in the app icon. These simple tips will ensure your app attracts the attention of those with compatible devices. Then use your proven app download strategies to gain traction. 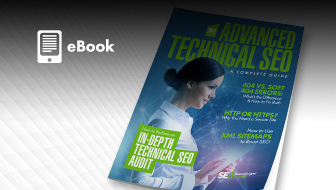 This can include app download marketing tactics ads on AdWords or Facebook ads to VR compatible devices, Firebase dynamic links on email newsletters, or owned media promotion. However, VR videos are not limited to being watched in-app. They can be viewed as 360 content on most social networks. This means they can be uploaded as a series of posts on Facebook, YouTube, and more. Be sure to link to back to your VR app so users download it and experience your content in full VR glory. Screenshots by Jes Stiles. Taken May 2017.